Syn Free Slimming World Chicken Korma Curry cooked on slow in the slow cooker. Enjoy Britain’s favourite Chicken Korma Curry without any syns in a creamy delicious korma sauce. When I was 16 I had the best job in the world. I worked in an Indian takeaway and got to have lots of lots of free curry! It was a small shop and I worked the front counter and served the customers. I took their order, gave them their salad bag, took their money and made sure that they got a good service. There was a desk behind the counter, so I could do my college work, while I was waiting for customers. As well as this I got fed as much Indian food as I could possibly want to eat. I would snack on the most delicious onion bhajis while I was working and then at the end of the night, they would give me a lift home and I would have loads of curry that was left over from the night. I finished at midnight, so my mum and dad would be in bed, when I got home from work. The door was right next to their bedroom and I walked passed it to get to the kitchen. My dad would always ask if I had brought some food home, like he was on autopilot in his tired state. I would often have about 6 takeaway portions of curry and loads of rice and there would be enough to feed us all for 2 nights, if not more. The next day the food would have gone in the freezer, or my dad would have had some for lunch. I worked at the Indian Takeaway 3 nights a week, so I am sure you can imagine how much leftover curry food we had in our freezer. The most common leftover curry food that we had was the classic chicken korma. It was always the most sort after item on the menu and because it was cooked in bulk, there would always be some left. 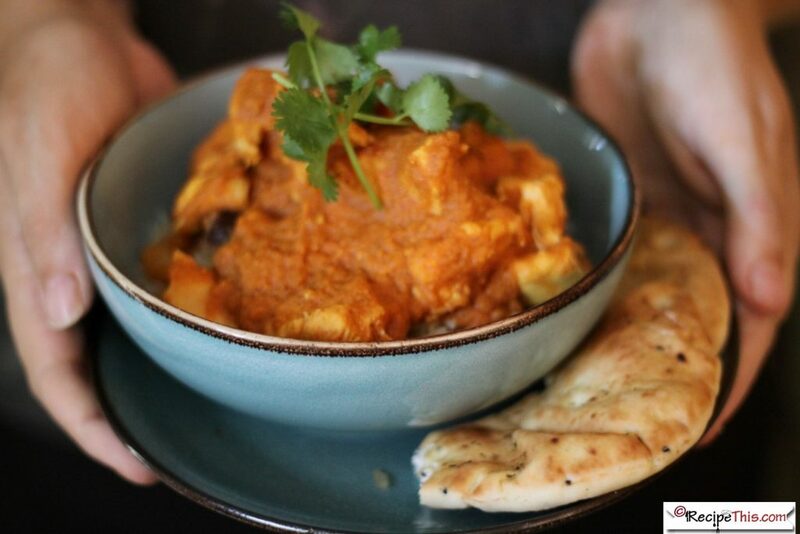 I used to watch the owner and his assistant cook their chicken korma and how effortless it was, and it made me think just how easy and how effortless it is to make a Slimming World Chicken Korma in the slow cooker. The benefit of making your own Syn Free Slimming World Chicken Korma Curry is that everything is easy to source, you can load it up with Slimming World speed foods and you can make extra batches for the freezer. I call my slimming world chicken korma my dump and go slimming world curry recipe. That is because there is no messing about and everything just goes in, a bit at a time. You start the Slimming World Chicken Korma process with peeling and dicing your vegetables and slow cooking the homemade creamy korma sauce. At the same time the main korma spice blend is also added. Your chicken korma now starts cooking slow. Next on the agenda is to blend your homemade korma sauce with your hand blender until you have that beautiful creamy korma sauce. You load up the korma sauce with chicken breast, leave it to cook slow and then a couple of hours later you have the most amazing Slimming World Chicken Korma that you have ever tried! It really is that simple to make a Slimming World Chicken Korma Curry. Then you can decide if you want to add some extra naughty items that have syns or leave it as it is! What I love most about making the marinade for a chicken korma is that there are just 3 main spice ingredients. You don’t have to spend hours looking for your chicken korma ingredients and you can just throw it all in the slow cooker. Syn Free Slimming World Chicken Korma Curry. Easy to prepare and a dump and go speed food curry recipe that will become a family favourite. Peel and dice your butternut squash and pumpkin. Slice the top off the peppers and then pull out the seed area. Thinly slice your peppers. 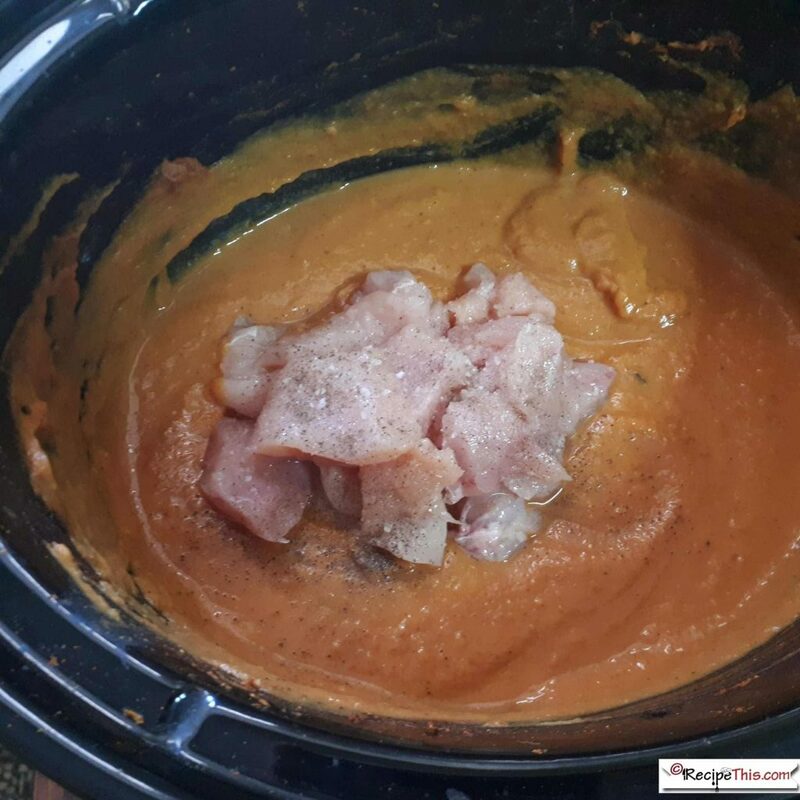 Place the butternut squash, pumpkin, peppers, marinade ingredients and first can of tinned tomatoes into the slow cooker. Mix well. Cook on high for 2 hours. Add in the Greek yoghurt and stir it in with a fork. Dice the chicken and add it to the slow cooker. Cook for a further 3 hours, stir and serve. Interestingly, our chicken korma sauce made enough sauce for 16 ladles. You could take half of the sauce out and then have 1 batch of vegetable curry and another with chicken. Or one with prawns. Or like what we often do is where we bulk up the freezer with korma sauce for another day. I kept our Slimming World chicken korma SYN FREE. If you wanted to you could add some almonds and some raisins to it, to make it more authentic. But we didn’t add these due to allergies. The can size we buy for our tinned tomatoes is 450g but any medium sized can is perfect!